On April 13, 2015, Czech political activist Vít Jedlička and a small team of libertarians traveled to an unclaimed piece of land between Serbia and Croatia called Gornja Siga and planted a flag, proclaiming the Free Republic of Liberland. Following a huge media splash, the country’s official website received over 400,000 applications for citizenship. The ideas behind Liberland are very similar to those that motivated the founding fathers of the United States. The date of the founding, which falls on Thomas Jefferson’s birthday, was chosen deliberately to honor the primary author of the Declaration of Independence. Our readers will be interested in the fact that Thomas Jefferson was also the author of the Statute of Virginia for Religious Freedom. 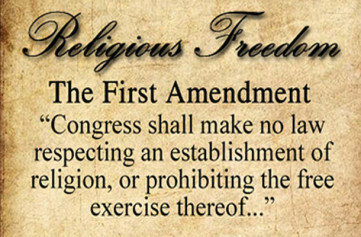 The statute prohibited compulsory attendance or compulsory contributions to any state-sanctioned religious establishment, and guaranteed the rights of individuals to profess their opinions in matters of religion. Jefferson wrote extensively on the subject, and we would like to illustrate some of the ways how faith can flourish in an environment of liberty. The blessings of liberty include the freedom of religion and the free exercise of one’s faith. As faith is a matter of individual conscience, we also hold the view that the state cannot compel someone to support one belief over another. We know the valuable contributions faith and family make to civil society – in fact, it is primarily these institutions that contribute the most. Keeping them separate from the state is of utmost importance. As Jefferson pointed out, there were many times in history when established church officials colluded with the state. In many cases throughout history one may observe the established clerical class “following their ambition and avarice combining with the magistrate to divide the spoils of the people.” Notes on Religion (1776). (We) have adventured upon a great and noble experiment, which is believed to have been hazarded in the absence of all previous precedent—that of total separation of Church and State. No religious establishment by law exists among us. The conscience is left free from all restraint and each is permitted to worship his Maker after his own judgement. The offices of the Government are open alike to all. No tithes are levied to support an established Hierarchy, nor is the fallible judgement of man set up as the sure and infallible creed of faith. The Mahommedan, if he will to come among us would have the privilege guaranteed to him by the constitution to worship according to the Koran; and the East Indian might erect a shrine to Brahma if it so pleased him. Such is the spirit of toleration inculcated by our political Institutions…. The Hebrew persecuted and down trodden in other regions takes up his abode among us with none to make him afraid…. and the Aegis of the Government is over him to defend and protect him. Such is the great experiment which we have tried, and such are the happy fruits which have resulted from it; our system of free government would be imperfect without it. The body may be oppressed and manacled and yet survive; but if the mind of man be fettered, its energies and faculties perish, and what remains is of the earth, earthly. Mind should be free as the light or as the air. We feel that freedom itself is an important safeguard of faith, as all throughout history, one can observe fallible men using the reins of power to take away the liberty of others, particularly religious liberty. From the Soviet Union to China, governments have tried to destroy religion and churches completely, attempting to force conversion of the population to atheism and murdering hundreds of thousands of clergy. Many Liberland supporters observed the turning of the tide against communism firsthand, and some are old enough to have played a role in this huge change towards the restoration of religious freedom. Liberland has no laws regarding sexual orientation, sexual preference or transgender issues. Our philosophy is that society should be based on voluntary association, and people cannot be forced to associate with one another if they are not willing. In contrast to many western countries, Liberland has no laws forcing an employer to hire someone they do not want to hire, to a landlord from renting or selling to someone they do not want to do business with. We feel that individual freedom and the right to enter freely into contracts is more important than enforcing someone’s narrow vision of political correctness. In Liberland, there is no religious test for public office or for citizenship. The Liberland government and its laws do not officially establish a state religion, and no resources are to be used in a manner that would imply the establishment of religion. This includes religious symbols paid for by taxpayer funds. Our policies concerning the displaying of religious symbols in publicly owned places is fairly straightforward. Since most property is private, there is no conflict created and citizens are free to express themselves as they see fit. Therefore, a privately donated Christmas tree or traditional Christmas display at our government house would be perfectly acceptable, subject to reasonable management of and decorum related to such displays. Also, wishing “Merry Christmas” or other holiday greetings is also perfectly acceptable. Public officials or employees are not prohibited from wearing personal professions of faith on their own person or celebrating traditional holidays in the manner described above. Liberland welcomes persons of all faiths united in the beliefs and blessings of individual liberty. Our supporters are of all faiths, and freedom of conscience is extended to everyone, no matter their creed, or lack thereof. Liberland is one of the friendliest countries to people of faith, and we welcome you to join us.